For as long as there have been schools, teachers have tried to find ways to keep children engaged in the classroom. Today a growing number of schools are using video and other digital games as teaching tools. Many of the games incorporate incentives and rewards to keep students engaged. Experts say the best of them are challenging as well as fun. But critics question whether game designers are promising too much. Some say not enough is known about how these games can affect the learning skills and developing brains of children. A discussion of the role of digital play in schools. Greg Toppo National education and demographics reporter, USA Today; author of a new book, "The Game Believes in You: How Digital Play Can Make Our Kids Smarter." Keith Devlin Mathematician and co-founder and executive director of Stanford University's H-STAR institute; he's the co-founder and president of BrainQuake,an educational technology company. He's also the "Math Guy" on NPR. Leah Hirsch Science teacher and curriculum designer at Quest to Learn, a public middle school in New York City. Robert Pondiscio Senior fellow with the Thomas B. Fordham Institute, an education policy think tank. MS. DIANE REHMThanks for joining us. I'm Diane Rehm. Many parents might not be thrilled about their children spending time at school playing video games. Don't do they do enough of that at home? But a growing number of educators are embracing digital games as teaching tools. Joining me to talk about the role of digital play in today's classrooms, Greg Toppo of USA Today. He's author of a new book titled, "The Game Believes In You: How Digital Play Can Make Our Kids Smarter." MS. DIANE REHMFrom a studio at Stanford University, mathematician and game designer, Keith Devlin. And by phone from Orlando, Florida, Robert Pondiscio of the Thomas B. Fordham Institute that's an education policy think tank. I'm sure many of you will want to join the conversation. Give us a call at 800-433-8850. You can send an email to drshow@wamu.org. Follow us on Facebook or send us a tweet. And thanks to all of you for joining us. REHMGood to have you all with us. Greg Toppo, I'll start with you. You begin your new book with what you saw at the Raymond Elementary School here in Washington, a school I know because I was born and raised here and went to an elementary school nearby. Tell us what's going on there. TOPPOSure, and thanks for having me. You know, I begin the book with a kind of a, I think, a fun, but very sort of quizzical scene where we are following an enormous velour penguin down the halls of Raymond as she's visiting classrooms. And it turns out that this penguin, this basically person in a penguin suit, is the mascot for a math game that these kids -- pretty much every kid at Raymond plays on a daily basis. TOPPOAnd, you know, none of us would know who this penguin was, but these kids, as soon as the penguin shows up in their classroom, everything stops and they yell her name. Her name is Gigi, as it turns out, and they know exactly who she is and what she's doing there. She is this, as I said, this mascot for this math game that guides them through, level by level, problem by problem, thousands and thousands of problems, math problems that they work on throughout the entire school year. TOPPOAnd what I say in the book is that this game that these games play has really helped them do better in math in almost every elementary class in the city. REHMNow, to what extent are we seeing these kinds of digital games being played in elementary and junior and high schools across the country? TOPPOYou know, it's hard to get a handle on exactly what's out there, but my reporting, what I saw, is that there was much more than I ever even imagined. This is a world that, you know, I thought I was just gonna see in a couple of places and I ended up seeing teachers using games much, much more often and being interested in games on a greater scale than I even imagined. And the fun thing about it, I think, was that unlike a lot of reforms that we've been seeing that are top down, you know, when you think of something like No Child Left Behind, you know, games are sort bubbling up from the bottom. TOPPOThese are individual teachers, in a lot of cases, trying something out and really liking it and sharing it with the person down the hall. REHMKeith Devlin, you're a mathematician. Why do you think it is that math is such a difficult subject for so many students and do you believe that these games can really help? DEVLINYeah. There are actual several reasons why it's difficult. The one that I think is the real killer is what I call the symbol barrier. And it's been known since the early 1990s with research all over the world that we got in Brazil with an international team, that if you go and look at people -- and the initial study was within children between the ages of 8 and 14 that were looking after their parents' market stalls. DEVLINAnd in the course of looking after their parents' market stalls, these kids that didn't have calculators or anything, this was back in the '90s, did incredible calculations working out the amounts of money and working out change. And the researchers logged their performance at about 97 percent accuracy. Then, they took these kids to one side in their homes later on. They gave them a little written math test. DEVLINNow, that written math test looked like a classroom math test and was a classroom math test, but it had the same problems that the kids had done in the market stall with 97 percent accuracy. What happened was the huge accuracy dropped to 37 percent. It wasn't that the kids couldn't do the calculations. They did them wonderfully in the noisy, bustling marketplace with all of the distractions. DEVLINThe problem was those symbols. It was an alien language. They had to get through the symbols to do their mathematics and that's actually had -- we actually evolved with capacities to do mathematics. It's part of natural selection. We did not evolve to read mathematical symbols, which were invented in the 16th and 17th centuries. REHMInteresting. And Robert Pondiscio, you said when you saw this book, you wanted to hate it. What happened? PONDISCIOOh, well, our words come back to haunt us, right? PONDISCIOI'm a bit of a ed-tech skeptic and I'll give Greg Toppo his proper respects here. He's reformed me somewhat. I'm still somewhat skeptical, but I'm not luddite. I guess I take a long view of education and I worry -- and Greg and I've had this conversation about the lure of the quick fix. And there's a tendency in education to kind of worship at the altar of the new thing and to the degree to which games and education technology at large are that new thing that we think, you know, all will be well, let's just load up classrooms with a lot of software and technology tools, you know, that's the kind of thinking that can be endemic in education. PONDISCIOAnd I worry a little bit still -- I mean, Greg has convinced me that there's some there there. These are the education games. But I still do worry that we're still looking for magic bullets that don't exist. REHMGreg, are you talking about quick fixes? TOPPOSomething you and my mom have in common. You know, Diane, I'm not really talking about a quick fix at all. I mean, what I talk about throughout the book, and I'm glad Robert brought this up, is the idea that games can be just a better tool. And when I say tool, I mean it in, you know, in the traditional sense. You know, teachers are always looking for a better way to do the things they already do and I think that's what games bring to the class. REHMBut I think the idea of combining games with work and games with teaching is something that probably a fair number of people are skeptical about. TOPPOYeah, I think they are and I think part of this, I think, stems from, in a way, we misunderstand what's happening when people, not just kids, when adults, too, are playing. You know, we have this idea that it's sort of slacking off or just, you know, taking a break, when, in fact, it's really -- can be very hard work. People can be, you know, really exerting a lot of effort. REHMHow do you feel about what Keith Devlin had to say in terms of using the real life tools and then translating those tools to numerical symbols and how difficult that can become? TOPPOYeah, I mean, I think if you ask math teachers, and Keith has much more experience in this than I do, but I think that idea of number sense is a really hard thing to teach children. And I think if a game can do it, I think, you know, we should be really investing more energy into it. I mean, one of the things I want to make clear is that a lot of the people in this movement, if you will, a lot of the people who use games, teachers who use games, you know, they're not doing it because they love games. TOPPOThey're doing it because they want a better way to do school and they haven't seen things improving quickly enough. So games are a solution not for their own sake. REHMKeith Devlin, you're also the math guy on NPR, we should say. How do you think that this approach that is incorporating games can help children learn more quickly, more accurately and take that knowledge from the game to, say, the workplace? DEVLINWell, let me give you an analogy. Supposing you had a child and the child -- excuse me. You child was interesting in music so you take that child to a music teacher. You would be horrified if that music teacher said, sit down, we're going to give you a lot of written exercises, you're going to learn to read the music and we're going to drill and test you on musical notation. No, what the music instructor will do will say, will you like to piano or the guitar or the cello? DEVLINYou would find an instrument that you like. You might play with the instrument and then, you would learn about music whilst you're learning to play the piano or the guitar or whatever else it is. And that turns something that would otherwise be drudgery into fun. It's hard. It's hard learning a piano. I never did very well at hit, quite frankly, but it's a fun thing to do. Learning to play an instrument is fun. DEVLINMathematics is very much like music. It's an abstract subject that's captured by abstract notations and it's an action that you do. You play instruments. You play music. You sing. You do mathematics. You solve problems. You think about it. You use it in the right place. So mathematics is an action. The best way to learn an action is by doing it, just as we learn music by playing instruments, we can now, because we have those instruments, we call them video games, we can now help people to learn mathematics by playing mathematical instruments. DEVLINThe games I design in my own company called BrainQuick are designed like musical instruments in that the goal is to provide someone with an instrument on which you can play arithmetic or which you can play geometry or you can play trigonometry. That because of -- well, we knew it works in music. It absolutely will work and we've already got evidence to show that it works, but it works with mathematics. REHMKeith Devlin, he's mathematician, executive director of Stanford University's H-Star Institute. REHMAnd welcome back. We're talking about using digital screens to help young children and older children certainly learn math and other subjects. Greg Toppo is here. He's with USA Today. He's author of "The Game Believes in You: How Digital Play Can Make Our Kids Smarter." What do you mean by the title, "The Game Believe in You," Greg? TOPPOYou know, that's kind of a variation of an idea about how, when kids are playing a game, the inherent -- the inherent sort of idea going into the game is that the game believes they can succeed. You don't go into it thinking, "Nah, this is never going to work." You pick up the game because you believe, you know, "This may be hard. This may be difficult. This may be a long slog. But I'll get it in the end." And that's the basic idea. REHMAll right. I've got some email and website concerns, Robert Pondiscio. The email says: "Our schools have totally succumbed to the allure of digital education. We're raising a generation of children whose only comfortable way to interact is through a screen. It's a tragedy, in part, because it conditions them to let others think for them. They only have to respond appropriately. Bring back human teachers who know how to teach. Turn off the computers, tablets and phones." REHMAnd here's a comment from the website, from Mike, who writes: "Digital screens of all types become insidiously addictive for kids. My 11-year-old got an iPod last fall. All she does is stare at screens. She used to lose herself for hours doing crafts and sewing. We need to do something about this as a society. It should be treated as a public health concern." Robert Pondiscio, how do you see those comments? PONDISCIOYeah, that was me, you know, not that long ago. I've tempered my disdain somewhat. But, that said, here's my guide for clear thinking about this. The moment that somebody uses the phrase, digital natives, stop listening. What I mean by that, is we have a tendency in education to worship at the altar of student engagement and assume that if kids are engaged, as they are by screens, then they are learning. So we have to be a little bit more discerning about not just the tools but what we put through those tools. PONDISCIOBut let me give an example of where I think this stuff can be productive. Two of the most difficult challenges in education are differentiation and assessment. Talk to any teacher and watch them roll their eyes when you say -- talk about differentiated instruction. It's one of those things that I think is more honored in the breach than the observance. But, you know, Greg makes a very good case that games do that very, very well. I mean, if you think about, you know, what is getting to a different level of a video game other than differentiated instruction? And with assessment as well, you know, we're forever trying to -- one could argue we over-assess kids. PONDISCIOBut assessing kids based on those levels is something that games do very, very well indeed -- probably better than we can. You know, so let's let the machines, as it were, do what they can do better than us. But your callers or writers, I think, are correct that we can't over-rely on these tools and we have to ask very clear and savvy questions about what exactly do we want these games to do. PONDISCIOAnd my general sense is that they're better at teaching skills than, say, content. REHMRobert, define, as you're using it, differentiation for us. PONDISCIOOh, sure. I'm sorry. It -- teachers are often told, since you've got a range of abilities in the classroom, that they must differentiate their instruction. That is, you know, meet the needs of every learner, whether they're reading, say, on a second-grade level or a ninth-grade level in one, single classroom. So we are told to differentiate instruction. And that is an enormously tricky thing to do. A game can probably do it -- it does so. It's a machine for differentiating. REHMKeith Devlin, how do you respond? DEVLINYeah. I mean, I agree with actually what everyone's said. If it sounded as though people were saying different things, I was at clear agreement with them, I was nodding here. When you -- I mean, let's go back to my original -- my earlier example of a musical instrument. The musical instrument is just part of learning about music. You learn piano. But you have a piano teacher there, you have someone to help you, you have someone to work with you. No one -- at least certainly not me and I don't think anyone in this conversation -- is suggesting that we put the machines there, we run the games, and then we walk out and let the kids do it. DEVLINNo. People learn by interacting with other kids. You learn from teachers. You learn from other kids. But if you have an instrument there that you can all crowd around and practice playing the tunes, the mathematical tunes, it's much more -- it's going to be much more successful. Because you actually are interacting with the mathematics directly in a semi-private, semi-public way. REHMAnd, Greg, you make the point that the best digital games are difficult. Give me an example. TOPPOI mean, Keith's is a great one. You know, it's really devilishly difficult, if you don't mind me saying, Keith. It starts -- it starts out very simple, you know, where you're basically trying to essentially pick a lock using combinations of different numbers. But the combinations go from being just, you know, two or three digits, very quickly, to getting incredibly complicated, with thousands and possibly even millions of combinations. And I think that's one of the things that is really kind of wonderful about games is that they can build bit by bit by bit, from very simple to very challenging. REHMAnd, Robert, would you agree that bringing games into the picture, if you will, is a heck of a lot better than watching kids turn off because they're bored? PONDISCIOWell, yes and no. This is what I was alluding to earlier in sounding a slight note of skepticism about what I call worshiping at the altar of student engagement. Sure. Of course, you know, attention is the first step to learning. If kids aren't paying attention, they are not learning. A good teacher can hook kids on virtually anything. Again, and I'm playing the role of the skeptic again, but my concern with an over-reliance on games is that we begin the conversation with our students engaged, and we're less discerning about the content of those games. PONDISCIOAnd I'll give you an example. And forgive me, I don't have Greg's book at arm's length. But there was one description in Greg's book about a game-based -- and Greg will correct me if I'm wrong -- on Thoreau's "Walden." And I should say, I did not play the game. I'm just going on his description. It's really more using "Walden" as an excuse, as it were, to role play as Thoreau. It's not terribly helpful, at least based on the description, as a guide to the text, as a way of grappling with difficult reading material. So this would be one example, in my mind, of an over-reliance or using something school based, as it were, as an excuse for something engaging, but perhaps not as enriching as grappling with "Walden" with a great English teacher. REHMAll right. What about that? TOPPOWell, you know, actually -- and that game is still being developed -- I would say, I think you're right, Robert. It can be misused. And I'm sure it certainly will be misused. But I guess my hope is that teachers use that game, maybe as the first introduction to something like Thoreau. And then once kids have that sort of embodied sense of, you know, "Okay, this is what he did. This is what this place looked like. These were the challenges he set for himself." Then, let's read the book. REHMNow, what about that, Keith? As you successfully integrate math teaching into these games, do you think that the teaching of literature -- the understanding, say, of poetry can also be successfully incorporated? DEVLINWell, these are tools. They're tools, like books and television and video and using the outside world and sort of bringing things in from newspapers, getting information from your family. We've got all these different tools. Video games -- and there are many different types of video games, in fact, most of them that I've seen are very terrible -- but even, let's look at the good ones. The good ones are tools that, when in the hand of a good teacher or a good parent or a child who's sufficiently motivated, can actually be very valuable as part of the education learning process. They're not the be-all and end-all. But they are an extremely useful tool. DEVLINAnd they are a tool that can do things that are very, very difficult to do without them. So there are definitely things we can do now with video games, that we simply could not do well at all in the past. DEVLINAs to Robert's point about the engagement, we've actually done research to show that kids can be engaged by math video games that are way beyond their capacity. So we -- we've seen kids engage in our games. They're not learning because they're trying to solve a puzzle that's beyond them. So part of -- and this brings me back to the differentiation that Robert mentioned -- one of the things you can do in a video game is you can monitor the child's progress and you can offer them challenges that are at what we call the zone of proximal development. They're at the exact level that they need to be in order to learn something new. TOPPOYeah. And actually, you know, one of the things I wanted to just say in response to the emailer was this idea, you know, that kids will not be able to interact with humans or, you know, they'll be addicted to these games. And I guess one of the things that I'm very careful to talk about and very careful to kind of put it front and center is this idea that, you know, games shouldn't be a better babysitter. You know? They should really be used wisely. You know, they're powerful tools. REHMAll right. And joining us now by phone from New York, Leah Hirsch. She's a science teacher and curriculum developer at Quest to Learn. And that's a public middle school in New York City. Leah, talk about how your school incorporates digital games in teaching. HIRSCHThank you for having me. HIRSCHMy school, Quest to Learn, we were founded in 2009 and were actually founded in partnership with an educational nonprofit called the Institute of Play. And the Institute of Play believes in harnessing the power of games to improve education. So what that looks like on the ground is that we write curriculum that is inspired by games. When kids play games -- and I think Greg talked about this earlier and the name of his book certainly hits on this -- when kids play games and they fail at a level, they want to keep on playing. And they want to keep playing and playing and playing until they get through that level. And, really, the big question that we ask is "Why can't school be like that?" HIRSCHSo we try a lot of strategies that kind of incorporate game-line structures, in order to make school feel more game-line. For example, in a game, you learn by doing. In a game, feedback is ongoing and immediate. And so we try to put those structures into the way that we design our curriculum. REHMSo what's been the response of parents? Are they all onboard or do -- are some of them questioning the value of games as teaching tools? HIRSCHSure. Well, our parents at -- in our community, they certainly chose our school. They put us down on their preference sheet. They wanted their kids to come here. It's well known that this is one of the teaching strategies that we use. So, for the most part, they're onboard. But I certainly -- hearing those emails, those are things I've heard in the past. And, you know, again, what Keith and Greg keep saying is that games are just one of many tools that we use in the classroom. There might be a day, a week, a month that goes by where no digital games are played and kids are writing and reading and doing traditional skills. So they're just one of many tools in our toolkit. HIRSCHFor example, in the last month, I've been teaching about cells and their organelles. And my kids have read about cells. They've written about cells, experimented, collected and analyzed data. And they've also played a few digital games about cells. REHMAnd you're listening to "The Diane Rehm Show." I think that Robert Pondiscio wants to say something. PONDISCIONo, it's -- she makes a very good point. And one of the things that was most convincing to me in reading Greg's book was a description -- because I'm not a gamer at all -- of what he described as the game layer. Which, if you think about it -- and what that means is you're hooking kids -- or the game layer is an overlay of game mechanics onto everyday classroom tasks. And when I read this piece of the book, I realized that as a classroom teacher, I've been doing these things unwittingly, and things that, in retrospect, were some of my most successful tasks as a teacher -- things as mundane as, say, math drills, which my kids -- I was teaching fifth grade in the South Bronx -- they loved to lower their personal best time in doing math drills. PONDISCIOIt was, you know, so I had unwittingly tapped into this game layer. We ran a classroom mock economy in my fifth-grade class, where everybody had different jobs. Which, in retrospect, was not that different than playing Sin City. Probably not as good as Sin City, but it had that kind of -- that game layer that really hooked kids. And there was another exercise that we did daily, something we called daily oral language, where we put sentences on the board with various grammatical errors. And it was most certainly a game to my kids to work in groups to figure out -- to best each other and find all the mistakes. So, you know, this is what has helped me overcome a bit of my skepticism. Because good teaching has always tapped into what Greg correctly calls, I think, a game layer. REHMBut at the same time, Leah, are you at all concerned that kids get the impression that everything's got to be fun? HIRSCHWell, no, because it's not. So, sure, I think that, I mean, there's research out there, right? Pleasure- and fun- and interest-enhanced learning. They make information sticky. They make kids form lasting memories. And I've observed that as a teacher first-hand. That when kids are having fun doing something and a teacher is skilled at providing the context for why they're doing it, it sticks with them and they remember that experience. And, like I said, there's a lot of days that go by without digital games. I mean, certainly the writing process is an example of something that can be boring and tedious. But there's still tremendous value in learning how to write. So our kids go through that process. HIRSCHAnd they know that a lot of the work that they do is, you know, going to be hard and going to challenge them. But the most important thing that we do at our school is we provide what you're calling the game layer. And there's a bigger context and connection to why they're doing that writing piece. TOPPOSure. Sorry. And I agree with what Robert and Leah are saying. I mean, there's a way in which, you know, school is already a kind of game. But it's just not a very good one. It's -- doesn't work very well for a lot of kids. Kids, you know, understand that they have to play a certain kind of role. And they just -- a lot of times they just can't do it very well. And teachers don't have the tools to help kids play those roles well. And so what we're in a sense talking about is helping kids define what the roles are, you know, break them down into things they can do day-to-day and minute-to-minute and be successful with those. TOPPOAnd another thing we haven't talked about, I think, really, very much, but, you know, Leah brought it up, is this idea of failure. You know, in American schools and I think maybe in American society, you know, we have this fear of failure that is kind of odd. And I think one of the things that's most fascinating about this world is that, you know, games are all about failure. They're all about failing and then trying something better. REHMGreg Toppo. He's the author of a new book, "The Game Believes in You: How Digital Play Can Make Our Kids Smarter." We'll open the phones when we come back. Stay with us. REHMAnd welcome back as we talk about using games as teaching tools. And I have to confess to both Robert and Keith that I am a person who can't bear lectures. I need to have interaction in learning. And so for me, this idea of game-playing makes sense because there is an interaction there. I think I've had my education here in this studio, interacting with my guests and learning so much from them because I've been able to be a part of that conversation. Keith Devlin, I wonder what your reactions are to my own learning disability, if you will. DEVLINI mean, learning is absolutely a social process. This idea of someone sitting in front of a screen and learning is almost oxymoronic. I mean, it's part of the process. One of the things good games do, good learning games, is they stimulate the players to talk to each other, to help each other solve the problems, to collaborate, to compete against each other. You throw these games, well-designed ones, into the learning process, and they act as a catalyst, they fuel the fire of learning, and people get interested. DEVLINBut it's not just the interaction with the screen. It's the interaction with other people about what's on that screen. So yes, I think you'd have found, Diane, that if you'd played games when you were young, if they'd been around, you would have maybe had the same career, but you'd have enjoyed it much more because you had another tool to help you do those social interactions. REHMRobert, what do you think? PONDISCIOWell, I think we've known that interaction and conversation is an effective teaching tool since about the time of Socrates. So no big news there. And again, I'm not a gamer, so I'm a little bit out of my depth here. I will take it on faith that yes, these do not inhibit interactions with other learners. I think what we want to avoid at all costs is the specter of walking into a classroom and seeing 25 kids on 25 screens, and that's what they're doing all day, every day. PONDISCIONow I'm not suggesting that's happening, but again, you can't be a student of education without worrying about the overreaction to the next big thing and a good idea. PONDISCIOThere -- and I'm very fond of saying that every good idea in education becomes a bad idea the moment it hardens into orthodoxy. So I'm fine with this, as long as this doesn't happen, as long it doesn't become the new orthodoxy, that this is how children learn best. REHMAnd here's a very interesting. Is Leah still with us? HIRSCHYes, I'm still on the line. REHMI'll address this to you. Our emailer says, I'm 69 years old. I've played games and puzzles for about 40 years, mainly after I graduated from engineering. I think what they exercise is problem-solving, which grows into increased confidence. What do you think, Leah? HIRSCHAbsolutely. One of the reasons why game play is such an important part of our school is to kind of build those -- we call them 21st-century skills, communication, collaboration, complex problem-solving, innovation. All of those skills are kind of hard to get at through traditional education, and games are a space that allows us to give our students a chance to practice them. So absolutely. REHMAnd here's a second email from Ann , who says, I have two grandsons, five and seven years old, first generation to grow up with computers, second nature for them to use them and learn from them. They play Minecraft. They talk about obsidian and mining and building structures as would kids in high school. Technology and digital screens are not the enemy. It's the old, traditional thinking about education that is. Greg? TOPPOYeah, you know, we could do an hour show on Minecraft. It was one of the things, you know, when I would tell parents, you know, I'm writing a book about games, they wanted to talk about one of two things. They wanted to talk about violent games, and they wanted to talk about Minecraft. REHMWell, tell us first about Minecraft. TOPPOSure. 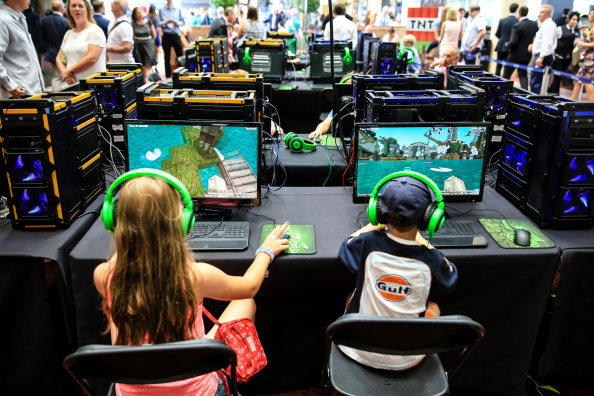 So Minecraft is this incredibly popular -- essentially it's an open-world building game. If you can imagine, if you've never seen it, if you can imagine sort of 3-D, digital LEGOs, if you will, and it's one of these games that's just sort of taken certain kind of age group by storm. I would say, you know, young, you know, elementary to middle school kids, you know, millions and millions of kids play it. TOPPOAnd, you know, one of the things that I think is happening, and, you know, the other folks on the panel can offer their opinions, I mean, it invites the users to build stuff, and that's it, to build and tear down and build something else and go to a new area and build something else and build with your friends and see what they built. To me, it feeds this sort of amazing, and I think unmet, hunger that our kids have to create, to make things that are their own. REHMInteresting, and Keith and Robert, can each of you speak to the issue of violence because that is so often what parents, everyone, is worried about, the impact of some quite violent games that kids play on their computer screens? Keith, I'll start with you. DEVLINYeah, I mean, on the face of it, if you're not engaged in them, games look like games. You just see someone sitting in front of a screen and tapping their screen or tapping a keyboard or using a joystick. But, you know, it's the same as to a book. Someone could be reading a sort of -- some powerful terrorist manifesto, or they could be reading a nice, friendly book. So you have to go into the game to see what's going on. DEVLINAnd there are -- if you pick a game at random, chances are it's either violent, or it's an educational game that's very poorly designed. There are actually not an awful lot of well-designed video games. Most of the good for learning, most of the good learning games are actually designed by former teachers, or they involve former teachers in the process. So they come into it knowing what they're doing. DEVLINBut this whole slew of violent video games, it's -- really, it's a different genre. You know, we use the same terminology, they're on the same devices, looking over someone's shoulder they may look the same, but they're terribly different kind of things. There's an awful lot of movies that I can't watch because I cannot stand gory movies. I don't like war movies. They just make me too ill. And yet they're just movies. There are good movies, bad movies, movies for some people, movies for other people. There absolutely are some terrible, what I would call terrible video games, violent video games. There are some very poorly designed educational video games. They're just there. They're just the same technology. DEVLINUsing that technology, however, you can design really powerful learning games that enhance the learning process. REHMAnd Robert, there's been a huge debate on the extent to which violent video games may affect the behavior of young people who watch them really all the time. PONDISCIOYeah, I'm a bit out of my depth on the effect of violent video games, but I would love to comment on the violence that we potentially do to education. And forgive me, Leah, I just have to react strongly. I -- one of the buttons that gets pushed for me is when people start talking about 21st-century skills. This is, you know, something I've been railing against for years. You know, we have this idea that we can short-circuit knowledge and directly teach things like critical thinking and problem solving, but, you know, and I'm not a cognitive scientist, either, but I believe that the broad consensus from cognitive science is that if things like this are domain-specific, and what I mean by that is you cannot be an all-purpose critical thinker and problem solver, so this is precisely what I fear in conversations about education technology and gaming, that we think we can forego a rich, broad education and just teach skills and use digital devices to teach skills that are really not skills at all, that are really a function of what you know about a given topic. PONDISCIOI believe there was a paper written some years ago, Dan Willingham of UVA talks about this, called "Could Steven Spielberg Manage the Yankees," and the answer is no because yeah, he's a creative genius, critical thinker, but he's a creative genius, critical thinker filmmaker. You know, you couldn't put him in the dugout in The Bronx and expect him to be any more successful than you and I. So this idea of 21st-century skills is precisely that siren song of the quick fix I alluded to earlier in the broadcast. REHMAll right, let's open the phones. I'll go to Karen in Cincinnati, Ohio. You're on the air. KARENThank you for having me. I'm thrilled to join this conversation as a longtime educator, and all I want to say is amen to Robert. I, you know, in full candor, I -- Robert is preaching my language. I also have to second his slight skepticism. My masters work, which would be an entirely different conversation, was an online program through UC, and it was in gifted and talented education. And I think what we're treading on is a very slippery slope when technology and technology-based assessments and, you know, very tech-driven instruction is seen as the panacea, that it's seen as one -- almost a one-size-fits-all approach. REHMAll right, and Greg, you want to comment. TOPPOYeah, I think Karen brings up a really important point, and I guess, you know, to me it's -- on the one hand it's all about balance, you know, balancing the tech versus the real-life interactions. And on the other hand, you know, it's about using technology not because we like technology or because kids love computers, it's using it because it works. And I'm not saying it always works. I'm just saying use it in the way in which it works. TOPPOYou know, just to give Leah's school, you know, proper credit, you know, I spent a lot of time reporting from that place, and one of the things that really struck me was that, you know, at the time, you know, going back a couple years, you know, people were calling it the video game school, and when you'd walk through the halls, you would never think that that was the case because there was actually not very much tech. Kids weren't on video games, weren't on screens a lot of time. TOPPOA lot of it, as I say in the book, is paper-based. You know, they have a lot of paper and foam core and cardboard. So they've really, I think, found a balance in a way that I think is really key. REHMAll right, to Ash in Tampa Bay, Florida. Hi, you're on the air. ASHThank you so much, Diane, it's really a pleasure to be on the show. ASHYeah, I'm a student at UC Berkeley, and my question is for Mr. Devlin of Stanford University. The question is, how is it that video games develop a passion for learning and set students up for a passion for innovation in mathematics? DEVLINWell if they work, they've got to be well-designed, and it's incredibly difficult to design, and, well, the vast majority are not. But mathematics is probably the oldest video game in the world. A mathematician, through the symbols, it's a very poor interface for most people because the only interface we've had to mathematic for 2,000 years or more is that symbolic interface. If you can parse through that interface, what the mathematicians do is create this virtual world and explore that world. DEVLINIf you talk to mathematicians about what they do, they say they discover things, they explore things, they unravel things, they see patterns in things. It's about discovery of a world. We only now have the technology to build better interfaces to that world, so you don't have to go through the symbols. They are the video games, the well-designed video games. They actually provide you with a simulation of doing mathematics in the same way you can learn how to fly a plane by flying in a simulator. You can learn how to fly an -- drive a car by driving in a simulator. DEVLINThe U.S. Army trains all of its soldiers in simulations. We now have the technologies to help people learn, research mathematics or everyday practical mathematics, in simulators. We simply have to build those simulators. We call them video games. Perhaps if we'd called them simulators, we'd have probably a lot more success, but not so many people would be using them. TOPPOI mean, you know, Keith, Keith said something that I think is really fascinating. You know, he talks about how if Euclid, the great Greek, you know, the father of geometry, had been around today, you know, he wouldn't have written "The Elements," he would've designed a video game. REHMAnd you're listening to "The Diane Rehm Show." Now to James in Pittsburgh, Pennsylvania. You're on the air. JAMESHi, thank you for taking my call. JAMESI'm just wondering, like, what universities are at the forefront of research into this area. DEVLINWell, I'd like to mention Stanford, although there's only a very small number of us at Stanford doing that research. University of Wisconsin is actually one of the big powerhouses, University of Central Florida, University of Southern California and a bunch more. You actually find most major universities, there are small groups. There's actually, at Stanford there's no department working on that, but there's actually about 30 or 40 people all across the disciplines that I'm aware of, that actually are doing video game research, and I know that because we have a weekly seminar where we exchange ideas. REHMAnd to Jennifer in Ithaca, New York. You're on the air. JENNIFERHi there. I'm a school-based occupational therapist. So what we do is focus on helping students to engage in their classroom activities to the best of their abilities. One of our main areas of focus is handwriting, and with the use of various applications on tablets and a stylus pen, I've been able to give them sort of a multi-sensory environment that they can practice their handwriting in. It takes it far past the basic drills of tabletop paperwork. They can interact with the letters, they can hear their sounds, they can practice step by step. It really provides them with kind of a structured area to learn from their mistakes without constant erasing. And with the pen, it really gives them the actual motor control that they can then take to the real world, onto paper. REHMThat's very interesting. Robert Pondiscio, do you want to comment? TOPPOI knew you were going to say that. PONDISCIOI'm old-fashioned and a Luddite, but there's good evidence to suggest that small motor skills are an important an often overlooked component of learning. REHMAre people, are teachers really continuing to teach cursive handwriting? TOPPOIt sounds like they are. I wasn't aware of this app, but it sounds like they are. REHMYeah, I thought young people were learning to print and stay with that these days. REHMYeah, or just keyboard. Well, clearly there's a lot here, a lot to be talked about and to be anticipated because I'm sure this is going to develop even further. Thank you all so much. Greg Toppo, his new book, "The Game Believes in You," and Keith Devlin, he's at Stanford University's H-STAR Institute. he's also president of BrainQuake, an education technology company. He's also the "Math Guy" on NPR's Weekend Edition. Robert Pondiscio of the Thomas B. Fordham Institute. And Leah Hirsch science teacher at Quest to Learn in New York City. Thank you all so much, and thanks for listening, all. I'm Diane Rehm.